Adhesion is the single most important factor when applying a roof coating to your existing roof membrane. Without excellent adhesion, a roof coating system cannot perform as intended and will likely cause leaks and other damage to the roof substrate and building below. 1. Is the coating compatible with the roofing substrate? There are multiple elastomeric roof coatings to choose from but they are not all designed to be applied over every roof substrates. 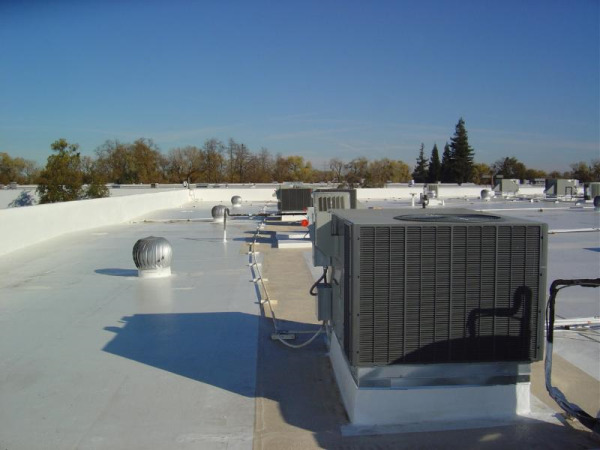 There are roof coatings specifically made for Asphalt, BUR, Mod Bit, and Capsheet roofing, there are coatings for Single-Ply Membranes – TPO, EPDM, Hypalon and PVC, and there are coatings intended for SPF, Metal and Concrete roofing substrates. These coatings are all formulated differently to provide the maximum adhesion possible to each of the substrates. For instance, Single-Ply membranes are the most difficult roofing membrane to adhere to because of how they physically break down and the residue that remains. Therefore, most roof coatings require a caustic primer or etching rinse to be done before applying an elastomeric coating. This extra step costs money and time but allows for adequate adhesion. National Coatings fortunately has a quick and easy solution for Single-Ply – the AcryShield A502 elastomeric roof coating. A502 allows for direct and tenacious adhesion to the Single-Ply membrane without the need for a primer or etching rinse. It is important to find the ideal roof coating that adheres to your particular roof membrane and gives you a cost effective and timely solution for restoring your roof. 2. How is the surface of the existing roof membrane? Surface texture provides a rougher area for the coating to grab onto and adhere to. The contact between the coating and substrate can benefit from a slightly rougher surface as the coatings are typically sprayed over the roof and then they spread to fill in the gaps and little dips/pockets in the membrane. This gives the coating a greater surface to adhere to; however, the texture cannot be too harsh as this can also create air pockets between the coating and the roof substrate. It is very important to pressure wash and clean the substrate before any application begins to insure that there is no dirt, film or other residue that could prohibit the coating from directly adhering to the substrate. You also need to make sure there are no areas on the existing roof that are not 100% adhered to the substrate. If so, you need to remove these areas before applying the roof coating as this can also cause air pockets and defects in the roof coating system. Lastly, we will discuss cohesion or the coatings properties that produce the strength and bonding ability to hold itself together as a cured and durable coating. Weather conditions, coating thicknesses and cure times are all factors that can either enhance or diminish the cohesion in the coating. It is necessary and important to follow the manufacturer’s recommended application guidelines as each manufacturer has different requirements for obtaining ideal cohesion. To learn more about National Coatings elastomeric roof coatings and restoration systems, download our FREE Benefits Brochure.